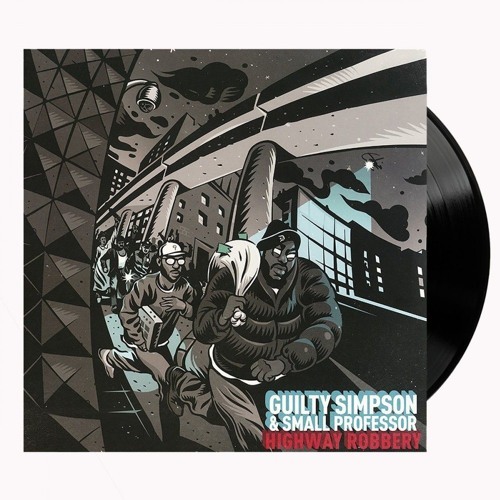 Classic Black Vinyl☛ smarturl.it/HighwayRobbery Coalmine Records is pleased to rerelease Guilty Simpson and Small Professor’s highly acclaimed collaborative LP, ‘Highway Robbery,’ on classic black vinyl. Weighing in at 11 tracks, which includes the vinyl-only bonus track of Zilla Rocca’s Remix of “Go,” the album places the listener in a seemingly post apocalyptic Detroit where the mentality is feast or famine. The LP plays as one long narrative of Guilty’s day-to-day survival in Detroit’s concrete jungle, all set to the backdrop of Small Professor’s ominous, percussion heavy production. Featuring guest appearances from Detroit’s Boldy James, AG (of D.I.T.C. ), Elucid, and Castle, with both Statik Selektah and DJ Revolution handling the Technics 1200s, this repress is limited to just 300 Units, for just $17.99.